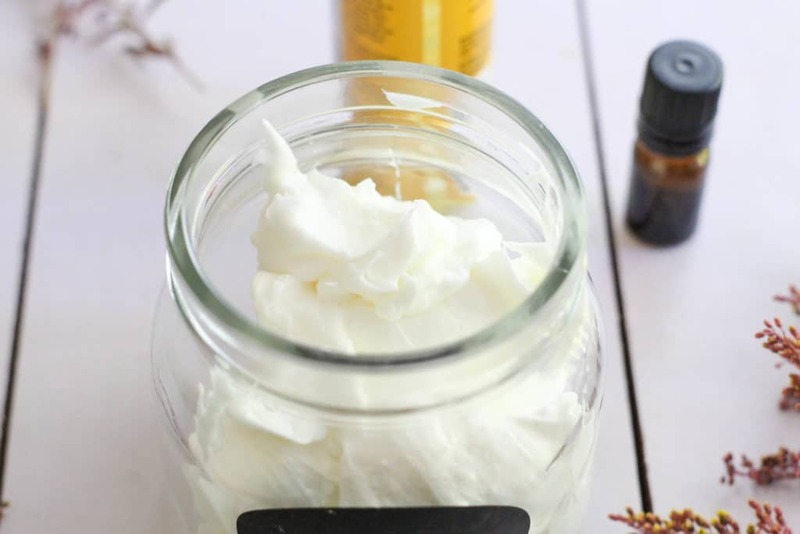 I love all DIY body butters, but this whipped coconut oil recipe is so easy to make, you can probably make it with what you’ve got in the kitchen right now! Like you, I’ve been seeking a natural alternative to those bottles of creamy (but chemical-laden) conventional lotions. Coconut oil has always been a top contender, but I couldn’t always make it work until I came up with this recipe. Why Use Coconut Oil in this Body Butter Recipe? I’ve been back and forth with using coconut oil as a moisturizer for a few years now. I love that it’s pure, natural and inexpensive. But we don’t always get along, and in the winter things get hard. Literally. I practically need a jackhammer to get enough coconut oil out of the jar to moisturize my dry winter skin. But deep down I felt there was a way to work things out. Coconut oil and I were meant to moisturize together. I just needed to figure out the how. What if you whip coconut oil? Well, by golly, I had a brand new KitchenAid mixer sitting on my counter (my husband sure knows how to melt a girl’s heart on Christmas!) and a big jar of coconut oil sitting in my pantry. The DIY-er in me took over. The result was a light and fluffy moisturizer that far exceeded my expectations. I love that this coconut oil recipe only requires one (yes, one!) ingredient: coconut oil. Anything else is completely optional. It only takes a few minutes to whip up enough coconut oil to give you months of moisturized skin. 1. Put all ingredients into a mixing bowl. Note: Do not melt the coconut oil first. It will only whip up if it’s solid. 2. 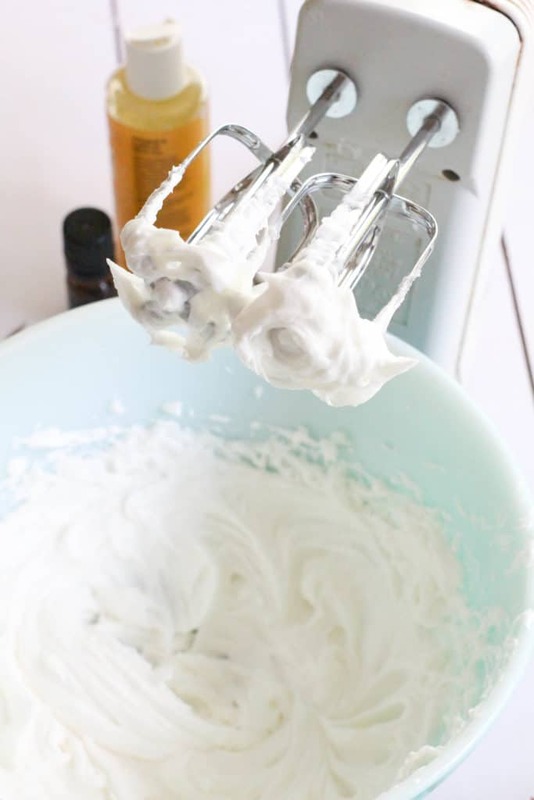 Mix on high speed with a wire whisk for 6-7 minutes or until whipped into a light, airy consistency. 3. Spoon the whipped coconut oil body butter into a glass jar and cover tightly. Store at room temperature, or in the refrigerator if your house is so warm it melts the oil. Order coconut oil online HERE. Looking for the best high quality essential oils? Learn where I shop for high quality therapeutic essential oils online. Can you use a hand mixer for this recipe? An electric hand mixer will work, but my KitchenAid stand mixer did an amazing job and I was able to get other work done while it was mixing away. What about a blender or food processor? A blender or food processor will not work with this coconut oil recipe, because they tend to warm the oil too much and prevent it from whipping up. Keeping your coconut oil cool is a must if you want it to whip. Why is my whipped body butter hard? Your whipped coconut oil should stay relatively soft, even at cooler temperatures. But if you’re in a really cold climate, it might harden up too much. If that’s the case, replace some of the coconut oil with sweet almond oil before you whip it up (try 2 tablespoons at first and work your way up if needed). You may need to melt the oils together first, then allow the mixture to cool and harden before whipping it. Does whipped coconut oil melt? Yes, this recipe will melt if it gets too warm (coconut oil melts at 76 degrees fahrenheit). If you live in a warmer climate, it might help to melt 1-2 teaspoons of beeswax with the coconut oil. Cool the mixture until it hardens, then whip it as usual. 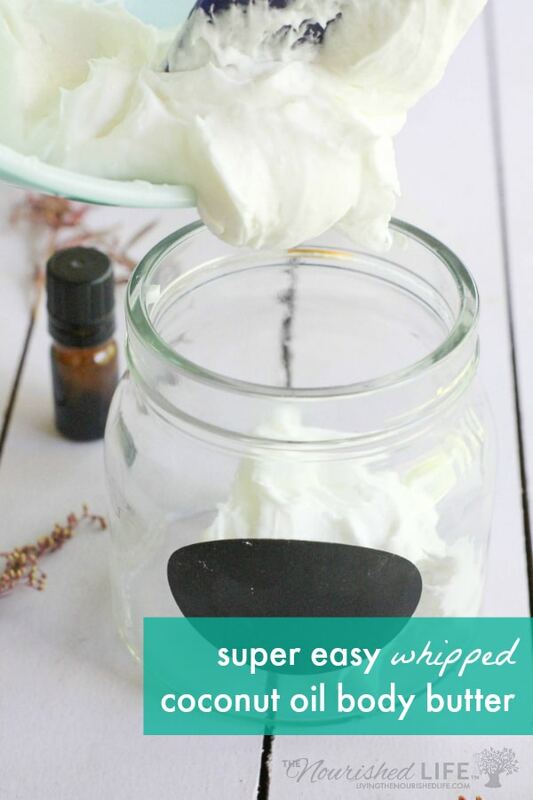 How to keep whipped body butter from melting? Try the beeswax method above, or you can try whipping shea butter or cocoa butter instead (both of these have higher melting points and work better in warm climates). How do I make this DIY body butter less greasy? Some people find the texture of coconut oil perfect for their skin type, while others find it greasy. Adding beeswax to the recipe can help (see two questions above). It also helps to use this recipe on damp skin right out of the bath or shower. Can you make this recipe without coconut oil? Yes, my next two favorites to use in this recipe are shea butter and cocoa butter. How long does this homemade body butter stay fresh? Because there are no water-based liquids in this recipe, your body butter should keep for 6 months or more. 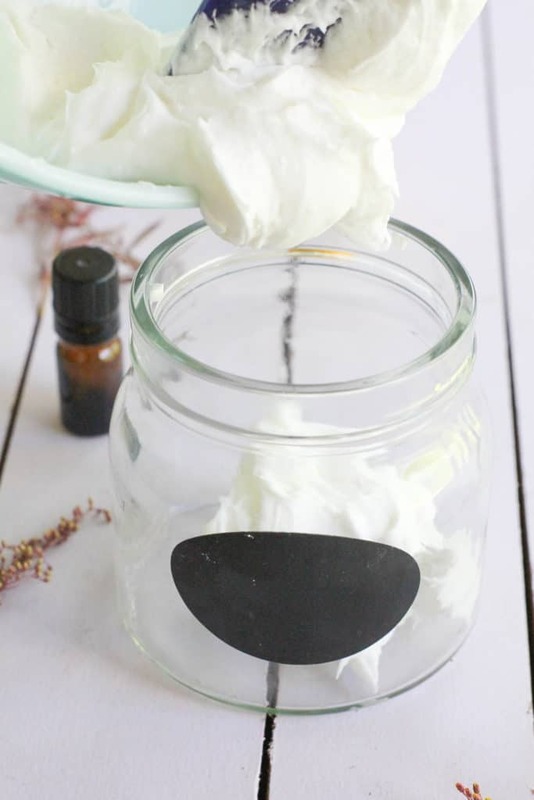 Have you made this DIY body butter recipe? I’d love to hear from you in the comments below! 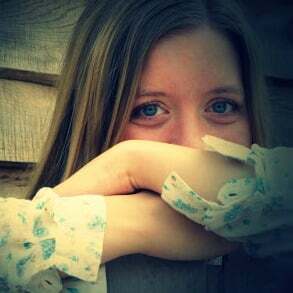 Elizabeth is the founder of The Nourished Life and has been writing about natural living for 12 years. 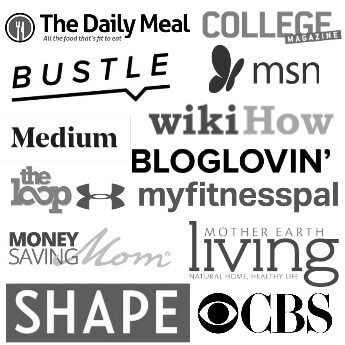 Her work has been featured at Shape, Bustle, and Mother Earth Living. 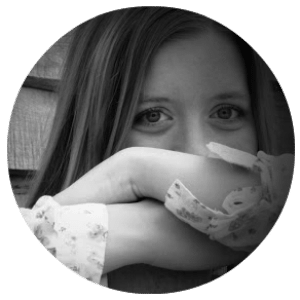 Her mission is to help you lower your stress levels and find fun ways to become happier and healthier. Read more about Elizabeth here. I’ve done this for a few years and I love it! Nothing beats it…nothing. Another added benefit is that as coconut oil is antibacterial, acne gets nipped in the bud. My adult acne is way way better! Hi Elizabeth. From many of the comments I have read, there often comment on the hrd consistency of coconut oil. On a different blog I read about “organic raw shea butter” as an ingredient for an underarm deoderant paste. Would that coconut shea butter be any softer than pure coconut oil and could a combination of the two do the job without having to do any whipping? I just wondered if the whipping, as it incorporates air, may result in a rancidity sooner than would normally be the case??? Shea butter will get just as hard as coconut oil in cold temperatures (harder, actually, since its melting point is even higher). To keep it softer, you can add some liquid oil like almond or jojoba instead. I don’t think the whipping affects the shelf life much. It should be good for at least 3-6 months, I’d guess. what happens in the summer? Does it still melt or is it a little more stable? I have a feeling this might melt in the summer months, but I’m not sure. In that case, it might do better in the refrigerator. Hello again. About the cream being kept in the refrigerator – seems it could develop mould! Msybe you have not fond this? Coconut oil is very shelf stable and mold resistant. If no water is added, the recipe is fine to keep out of the fridge. You may fins problems with mold if water is introduced from wet hands/steam from bathroom or germs from using your hands/fingers to dip into the jar. To avoid this try using some sort of scoop. Like a popsicle stick/toung depressor or small spoon. This is what I do when using my brown sugar coconut oil scrub. I don’t think that’s pure coconut oil. They would have to add something to it for it to stay liquid. Coconut oil is liquid at room temperature, So if it is slightly warmer it will melt and become liquid. You probably just saw some that had been at room temps. It will still melt in the summer months, which I find more of a problem. For that, you can add a small amount of beeswax to the recipe. Or use a more solid oil like cocoa butter or shea butter. Im so excited to try this! How is it as a facial cream? Is it not as oily when it is whipped? When it’s whipped, it makes it easier to use just a little and spread it evenly all over your face. If you really dislike oil on your face, then you might not like it, but if you use the right amount it’s really not too bad. I have used coconut oil as a facial cleanser for a while and found that using a damp cloth to wipe off the excess helps deter that oily feeling on your face. I used to use it as a moisturiser but it burns when it gets in my eyes so I’m not a fan of that anymore as I am always rubbing my eyes! To cleanse, I put a dollop of coconut oil in my palm, spread it between my two hands and then massage it into my skin in circles. I make smaller, firmer circular motions around trouble areas- blackheads on my nose, dry patch on my forehead and then I wet a clean facecloth in water as hot as I can stand it. Wring it out and lay it over my face for a few minutes so the steam opens up my pores. I do this a few times and then begin gently wiping off the excess oil with the same washclosh, dampened. Sometimes I just step into the shower instead, leave it on while the steam builds up and then rinse it off with warm water in the shower until it feels like the excess oil is gone. You can also do this with coconut oil or almond oil… worth googling to learn more and figure out which oil might be best for you. I also tried using coconut oil as a facial moisturizer. It burned my eyes even though I didn’t put it near them. I now use almond oil or avocado oil to cleanse my face and wipe off with a hot rag. My face is very soft and the wrinkles aren’t as pronounced. The coconut oil I have is pressed not refined and it’s very mealy. Will this still whip up with my electric mixer? If it’s coconut butter and contains coconut meat, then it might not be best for this recipe. But if it’s virgin oil and just solid because it’s cooler, it should work great. it’s equally as oily but wonderful. my opinion of course. Mine keeps getting really hard. How do you get yours to stay whipped? I’ve been using coconut oil to fight acne since I was 12. It really is the best!! Wow, great idea. I’ll definitely give this a try. Something I’ve always done is put the jar in the shower with me and then it’s the perfect softness to rub on. I also found if I rub it on a little wet still, it’s not as oily and absorbs nicely making it last longer through the day on my skin. I also notice that slightly damp skin seems to enhance absorption. It’s perfect after a relaxing bath! This would also make an awesome base for the medicinal qualities of Young Living essential oils. Coconut oil and lavender have helped heal many skin issues, but it was so hard to work with the coconut oil. Thank you for sharing!!!! If you use young living you can use copiba, frankincense, and geranium. All great for skin issues esp with coconut oil!! can you use the oil on your face? I do. My sensitive, acne-prone skin loves coconut oil. It can’t handle the chemicals in typical facial moisturizers. Thanks for the great post, Elizabeth. I first found out about coconut oil several years ago when a family member that had shingles heard it could help clear up their condition. Soon after (and after a great deal of research), I started finding uses for it in cooking, baking, and body lotion for my wife and myself as well. Thanks for your comment! I agree–coconut oil has so many uses it is hard to imagine life without it. From what I recall, she actually took it both ways: Topically on the affected area, and internally as well through a ‘tea’ when she mixed it with stevia and hot water. To be honest, I don’t recall exactly how long she used it, but she said that it helped. Okay. A family member on my husbands side is currently suffering from shingles. Has been in a lot of pain and the next step is electric shock waves to alleviate the pain here in the next two weeks or so. I understand that coconut oil is anti-microbial, anti-fungal and anti-bacterial. Sorry, I am continuing the response as I started to type the 6th line – the cursor was moving, but no words were showing up?? Anyway, I guess I’ll see if he will take about a Tablespoon internally a day and apply topically. Alone? Thanks! I think alone would be great, but I really like the recipe that Elizabeth provided as well. Vitamin E is considered to be very helpful in fighting shingles. She also suggested an essential oil of choice, and I know that tea tree has many properties as well that is supposed to support the response against shingles. Hey Cindy— Your comment led me to make a phone call. I guess she had one bout with it that lasted about 12 weeks, prior to using coconut oil. Then, she had a 2nd bout with it about a year later, and after about the 6th week began using it, and within two weeks, it had cleared up. She strongly attributes it clearing up quickly to having used it, and says she wish she would have used it sooner. Also, she said it was quite soothing as well. All very interesting to read. Shingles is caused by the chicken pox/varicella virus. Hope they cleared up quickly, it causes a lot of pain. My mom had shingles. She started getting B-12 sots and within a week, it was gone. Boy do i wish I knew about the coconut oil helping shingles.I had it about a yr ago.It was hell.I had it under my breast. Thank you for your post. I love coconut oil for my skin. I have also found a good solution in to melt it and pour it into a silcone ice cube tray and then pop them out when they reset and use it like a bar of soap. I just keep it in a little container on the counter. That’s a neat idea! That would be convenient for traveling as well (provided it didn’t get over 76 degrees!). Mix in a little beeswax to keep it solid. use 92 degree coconut oil. Definitely a good alternative for warm weather! sorry if this a duplicate, I don’t see my prior post. Was wondering if 92 degree coconut oil will still melt on the skin the way 76 degree does since skin temp is usually around 92. I’ve had probs with CO being sticky, not absorbing into my skin & rubbing off onto my sheets. I will try this in the shower while my skin is still damp. Hopefully it works! Thanks a lot! Apply to DAMP skin – left that out. Do you think this will help with severe itchy skin (unknown cause, maybe from medication)? My skin has been extremely itchy for 3+ months and nothing except Prednisone seems to help. I would rather not take Prednisone and try something natural. For severe dermatological issues I use pure organic neem oil and apply it topically. You can also mix the neem oil with your coconut oil. I first used neem oil on my dog who had developed severe allergical dermatitis on account of vaccines. Tried to treat him together with the vet, even had an own blood serum developed to be used as a vaccine….nothing doing, the only thing that helped to a certain degree were antibiotics….NOT good for long-term treatment. So in the end I followed a friend’s advice on neem oil, it worked and never looked back again…..needless to say, I’m not vaccining him any more! Becky, Are you using virgin coconut oil? I have been using coconut oil for about 8 years for sciatica, cramps in my legs, and as a rub for my sore back. It rubs off on my sheets but has never left a stain; just washes right out. I also use it for my skin. How do you use it for Sciatica? Yes, I am curious about this also, since I have sciatica too. My friend tried this, but the oil never changed consistency, no matter how long she left it in the mixer. Any suggestions? Did she start with solid oil? Since my house is on the cooler side right now, my oil was solid. I’m thinking that helped it whip up so well. I will ask her. We are in Arizona, so it doesn’t get that cold here. Would refrigeration help or hurt? It might help to refrigerate it until it’s fairly solid and then try to mix it. I started with solid coconut oil & whipped & whipped in my stand mixer with the whisk attatchment & it never changed consistency for me either. Maybe I’ll try refridgerating & re-whipping tomorrow. Ugh, I’m sorry it didn’t work for you! I haven’t done this enough to know how to troubleshoot it, though. I wonder if weather conditions have something to do with results? I wonder if there were impurities in the oil. That could possibly be an issue. I would think it would need to be pure with no additives. Well, the recipe says you can add essential oils and Vitamin E to it, so I doubt it would need to be pure. My coconut oil was completely pure as well, and it never whipped up. I live in Southern California, and it’s not that hot here. I guess I will refrigerate it and try again. I tried this for the first time tonight! It’s rather cold where I live at the moment and my electric stick mixer wasn’t working. So I got out the hand whisk and some elbow grease… took a while but it did finally work! I live in Canada and have whipped mine in all weather conditions and all types off coconut oil with no problems. I use a hand help mixer and have also used oil that came out of the cupboard and out of the fridge. It NEVER seems to take long at all to whip for me less then a minute for sure. My faviourt one i make is a scrub coconut oil, pure vanilla oil, brown sugar and coffee grounds, I mix whip it all up, put it in a container and put in the fridge or cupboard. That sounds like a lovely scrub! I have to try that one. I was having the same problem of the oil not whipping, where I live it is about 90 outside, to solve this problem I took a smaller bowl than the one I had the oil in and put ice in it till it touched the bottom of the other bowl, the oil whipped up in no time!!!! Would this lotion/whipped coconut oil work on feet? I get cracked heels really bad and nothing seems to help. It is AMAZING on the feet. Keep massaging it in every day and you won’t believe the results. If you can tolerate it, massage it in and sleep in socks. I have a trick for feet (using coconut oil) which I’ve been using for a few years now. I don’t use whipped coconut oil, although that sounds like a good idea for faces, just regular stuff right out of the jar. I use about 1 cup and melt it (whichever way works best for you – I sometimes let it melt in the jar in a sink of hot water, or if I’m in a real hurry, I’ll use the microwave. Put the oil into two plastic bags, like old bread bags, and sit down in your favorite chair and then put a foot in each bag and wrap the bag around your ankles to keep it in place and then leave for about 30 minutes or so. Have an old towel handy and wipe off each foot as it emerges from the bag, and then into a pair of socks. I do this before going to bed at night but do whatever time of day works for you. ***Note: if you shower afterwards, be sure to put a towel into the bottom of your tub so you don’t slip and fall. Also, I mix a little coconut oil and lavender oil together and put a VERY small amount in the palm of one hand and rub it all over my hands, through my fingers, onto the backs of my hands, etc. Then I gently run my fingers and hands through my hair. My hair is very long and after being washed it tends to be fly-away. This calms things down and doesn’t get greasy. Gives it a lovel shine, too. I don’t, however, use it on my bangs because they get too oily. I don’t know if the whipped oil would work for this or not because I haven’t tried it yet, but I will! ***NOTE TO ELIZABETH: I don’t know if this is happening to anyone else, but while I was typing this message, the area where the “post as” box is located creates a small bar where about 4 or 5 lines of type don’t show up while I’m typing, so I can’t see if I made any mistakes or not. It’s like typing blind. WHY is that happening?? Sorry about that! This is an occasional glitch in the comment system. Fortunately it doesn’t happen too often. I second the socks! Coconut oil alone wasn’t enough for my feet, but putting on socks right after makes all the difference. Very cool! I wouldn’t have thought of whipping it up, even though I use it every night as a “cream”. I initially was using coconut oil right out of the jar, too. Then I came up with an idea to create a nutrient rich, all natural, Super Body Butter, if you will. 2 parts coconut oil, 1 part shea butter, 1 part cocoa butter, vitamin E (in carrier oils). It’s fabulous! I don’t have a nice stand mixer, so I melt it slightly, and use an immersion blender to emulsify it. I don’t know if its my lack of patience or blender power, but it just emulsifies rather that really whips up. But it’s still great. I use it every day, and smear it on my kids after baths. Good stuff! I always wondered if mixing other oils with the CO would work. Do they separate after a time, or does the whole works stay bound together? I’ve mixed essential oils with CO, of course, but that’s only a few drops at a time. I think more solid oils like shea and cocoa will work, but I am not sure if liquid oils (like olive) would work as well. It might work with a small amount of liquid oil, but too much liquid oil will likely prevent it from whipping altogether. Shea butter and cocoa butter will mix well with coconut oil, though. That sounds divine! I think mixing with shea and/or cocoa butter is a great idea, especially in warmer climates where melting is a problem. That sounds very close to the beard balm I use. My beard stays so soft. What a great idea! Here is Colorado the coconut oil get very tough to dig into in the winter…love this idea, thanks. Brilliant! Just what we need. My 8 year old has very angry hands after using school soaps. We’ve been putting on coconut oil at night, but it’s so messy and hard to get massaged in. I’ll try the whipped because it IS working, if only for the night. Her hands are always much better in the morning if we do this. Thank you! Have you tried gloves? My daughter had trouble with dry hands earlier this winter, but moisturizing and then wearing gloves all night solved the problem within 3 days. She hated the gloves at first but didn’t care once she saw how quickly it worked! My daughter has eczema and you can have her dr request the school for her to use your own soap that she brings to school and use and creams. AS gross as it sounds I’d rather my daughter just use water than use any other soap than what she can use due to her issues and the end results. I too actually tried whipping the CO and it turned into a cream instead. I had found a different recipe on a website which was almost the same as yours except 1/2 cup of CO. And although it made my skin feel good (I had to wipe off some I put to much on first time user here) the consistency of it was just not a good feeling. So I googled and found your page. First thing this morning I pulled out my kitchen Aid and started whipping it. I whipped for 20min realized it was not going to get any better and stopped but it is more of a cream at least now and thin. My next batch I’m going to try from the Frig since I live in Vegas. When I measured the oil it was not hard at all. It was thickish but not hard. I heard it helps with razor burn and so I’m going to have my daughter try this as well on her legs. How long does this last on the shelf? It made quite a bit?